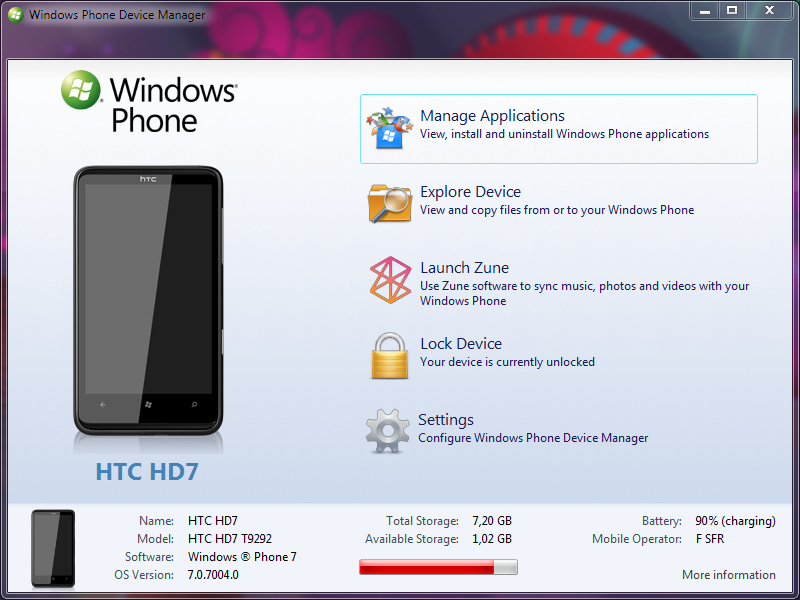 Windows Phone Device Manager allows you to manage your Windows Phone 7 device from your PC, you can simply view, install and uninstall “sideloaded” applications, explore device, transfer and sync files,… It is compatible with all Windows Phone 7 devices. Windows Phone Device Manager detects when the phone is connected or disconnected, if you don’t have a registered developer device it can automatically unlock your phone, so you don’t need ChevronWP7 anymore. You can also connect to your phone via Wi-Fi, for example to transfer files from/to your phone using Windows Phone Device Manager or the provided Windows Phone application. If Windows Phone Device Manager becomes popular I think about creating an open marketplace for non-commercial applications. Developers are welcome to join the project! A first version will be released in the next few days. Yes! Why on earth did Microsoft get rid of activesync. I have a job to do remotely, and I would have dearly loved to be able to download an email attachment (note – not a common file type but one specific for an application) on my phone and then transfer it to my work computer. But instead of the old regime, where I could transfer files easily back and forth, now no mechanism comes with the phone. No tethering either… And I have had no luck finding one on the app center. You’d think microsoft would provide one. I hope this one comes out soon and works well.